The standard Land Rover kitchen unit is a steel cabinet that contains a cooker and a sink. Below these is an bottom hinged front door provides you with access to the base for storage. There is a gas shut off valve inside the cabinet located on the right side. The kitchen unit is painted Hammerite silver and has hinged aluminum lids covering the top of the unit. A top front door exposes the burner controls and the broiler area. Martin Walter used the Calor brand propane stove with two burners and a broiler as their standard unit. The design of the Calor stove changed over time and is reflected in differences found in different year Dormobiles. 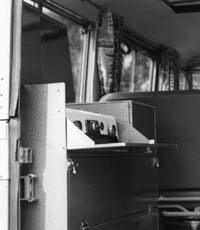 This Calor cooker unit came on a 1962 Land Rover Dormobile. The grill is made of two cast iron units. The top door is in the up position potecting the controls. 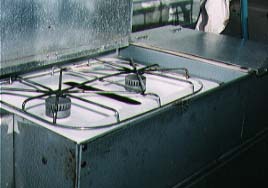 This stove is in a mid 1960's Dormobile and seems to be the most common version used. Some grills are blackened steel and others such as this one appears to be made of stainless steel. 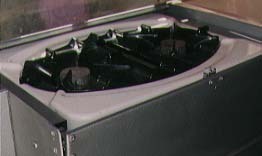 The slot in the centre of the cooker is a vent above the centre of the broiler. This stainless steel grill is usually associated with late 60's early 70's Dormobiles. Notice the aluminum lids in this picture. They provide a drain board surface for cooking or washing dishes depending which side is down and protects the unit whilst traveling. This picture shows the top door lowered for access to the burner knobs and the broiler space. Just below that can be seen the door for the lower strage space. It is held in place by 2 top latches and hinged at the bottom. This is the ever elusive broiler pan that often gets lost out of Dormobiles. Any broiler pan will do that provides a cooking surface about one inch above the broiler comparment floor. Thin sliced meats work best because of clearence. Meats cook quickly in the broiler. With a little practice you can broil some delicious foods. The standard Land Rover Dormobile sink is light pastel pink plastic. It drains through a plastic tube at the bottom of the sink. The plastic tube goes through a hole in the floor and does not have a holding tank.